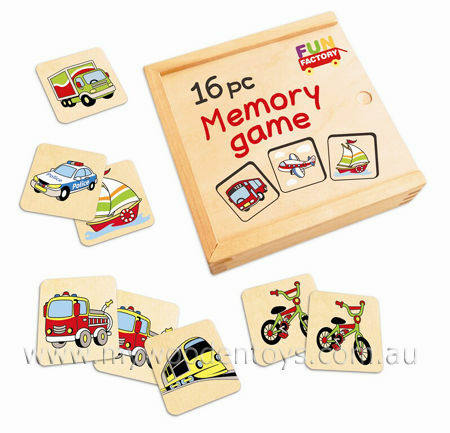 Simple Wooden Memory Game is a classic remembering and pair matching toy with pictures of things you might see everyday. You place all the pieces face down and take turns turning over two tiles. If you make a match you keep them. If not you turn them back over. The trick is to try and remember where the different pictures are so you can make a pair. This set has sixteen wooden tiles making eight pairs so it is not too difficult to make a match. This memory game comes in a well made wooden box with a sliding lid. The little pictures are printed directly onto the tiles so there are no stickers to peel off. Size: Box is 12 x 12 x 5cm Wooden tiles are 4.5 x 4.5cm. Material: Wood and Child Safe Paint. We like this because: "Simple and not too many pieces so young children can succeed making pairs."